Whose Afraid Of An Empty Holster? Should students have less freedom and safety than other citizens simply because they attend college? Many students at America’s universities are asking this same question: Why are they not allowed to defend themselves from campus attacks? College students are mature and responsible enough to cast a vote, fight a war, own a gun, carry a gun, and exercise every other right of citizenship exercised by other adult citizens … then why should they be forced to go unarmed and be defenseless at institutions of higher learning? While our law makers debate, delay, argue and defend the status quo, far too many college students are being raped, mugged, and robbed at gun and knife point … or they are caught alone and outnumbered by punk gangster wannabes! There is no need to change current gun laws … simply give people on college campuses the same rights they have everywhere else. Of course … anti-gun nuts will argue that guns will start going off randomly and students will break out into gunfights all the time. This argument, of course, ignores the fact that people who get concealed carry permits are law-abiding citizens … and the gangster wannabes already have illegal guns anyway. Many law-abiding citizens with concealed carry permits are already permeating the society … folks just don’t realize it because of the “concealed carry” part … and they do not “break out into gunfights.” However … they can protect themselves. 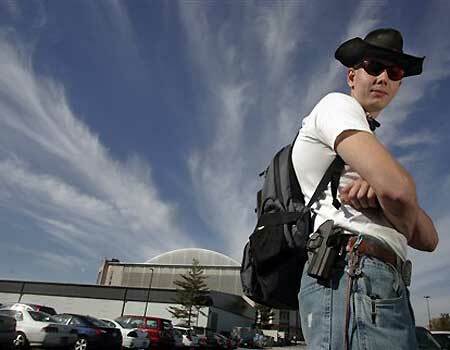 A group called Students for Concealed Carry on Campus are leading the fight and wearing empty holsters to protest state laws and student codes of conduct that prohibit them from exercising their Second Amendment rights even though they have a concealed carry permit. So far, Utah is the only state that expressly allows the Right to Carry on public college campuses thanks to a 2004 law allowing the Right to Carry on all state property … and Utah has not disappeared in a blaze of gunfire. Sadly … a bill that would have required colleges in Virginia to allow Right to Carry permit holders to exercise that right on campuses died in committee not long before the Virginia Tech tragedy where an armed maniac killed 27 students and 5 faculty members. If a few of those students or faculty members had been legally armed … perhaps there would have been a few less funerals to attend. Though no longer a student, I am a staff member at an American university … I applaud their efforts and am supporting them! The independent National Journal ranked John Kerry as the “Most Liberal” the year before he lost the race for the Presidency. Senator Barack Obama, now in his 3rd year of serving in the Senate, has taken the title of “More Liberal than Kerry, Kennedy and Hillary.” According to the ratings, Hillary Clinton comes in at #16. I will never understand Obama’s claim that he is a unifier … and that only he will be able to bridge the gap between conservative Republicans and liberal Democrats. Obama’s policies and priorities come straight from the progressive liberal play book. Of course Obama talks about bringing together Republicans, Independents, and Democrats … but how exactly is that going to work? Is Obama somehow going to retreat from the positions that Al Gore, John Kerry, Hillary Clinton, or John Edwards held. I think not! I might buy some of the unifier rhetoric if Obama became willing to discuss vouchers for School Choice … or dismantling the NEA and its disastrous effect on our public school system, … or when he decides that entitlement programs need real reform that include ideas like personal individual retirement accounts. This is an absolute disgrace to this country! A true American tragedy! Let me say that when I first read this … being a veteran myself … I was really angry … and I mean jump up and down, punch a hole in the wall, storm the White House kind of angry! 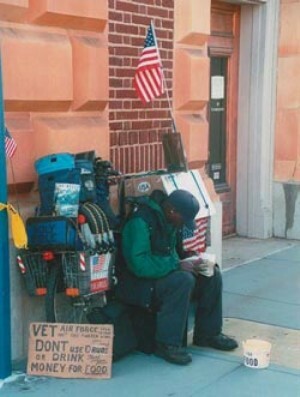 The Veterans Administration estimates that there are about 193,000 homeless veterans living in the U.S., veterans who have served this country when asked. Col. David Hunt thinks the number is closer to 500,000. The fact that there are homeless people in this country is certainly tragic … but I have to agree with Col. David Hunt … the fact that there are homeless veterans in this country is criminal. These veterans, mostly men, put themselves between us and harms way, fought our wars, spent countless days and nights in the worst hell holes to be found around the globe, and stood at a wall and said “not on my watch.” They have been wounded, tortured, lost limbs, and lost many close friends while protecting our way of life … then they return home to live under a bridge? That simply should not be!! This is not President Bush’s fault … nor President Clinton’s fault … nor President Reagan‘s fault! According to Col. Hunt, this is every administration’s fault since Valley Forge. I say that a nation that does not take care of its veterans does not deserve to have them and eventually, is doomed to fall!! I am going to take a close look at what I can do to help … won’t you? Some French folks do still have guts! Thérèse Delpech is the director of strategic studies at the French Atomic Energy Commission. She recently delivered a blistering critique of all the key players in the Iran nuclear controversy including Great Britain, France, Russia, China, Germany, and … of course … the United States. She also body slams the International Atomic Energy Agency. Her review of Iran’s nuclear program demolishes the notion that the program was designed for peaceful purposes . Launched in secret 20 years ago, pursued in violation of Iran’s legally binding safeguards obligations, and with no economic justification for the immense investment required … Iran’s program only makes sense as a nuclear weapons program. Why isn’t Moscow more concerned with a Muslim fundamentalist state on its borders with nuclear armaments? In private, Russian officials agree that Tehran is pursuing nuclear weapons … but still has provided considerable nuclear assistance to Iran over the last 15 years and continues to block meaningful action against Iran at the UN. In Moscow, it is sometimes very, very hard to tell the difference between strategic issues, commercial issues, and outright criminal activities! China has a similar record … but China relies on Iran for 15% of its oil imports and is the world’s second largest consumer of oil. China is also working to establish a diplomatic foothold in the Middle East … and does not want to rock the Iranian boat. Great Britain, France and Germany lead the international effort to negotiate with Iran, but their efforts have more to do with attempting to prove the superiority of “soft power” to the muscular foreign policy of the Bush administration, than any real attempt to end Iran’s nuclear weapons program. So far, due to Russia and China’s efforts in the UN Security Council, their negotiations have met with no measurable success. And … the U.S.? Distracted by War in Iraq and burdened by all the tragic developments in U.S. – Iranian relations since the fall of the Shah … is, in fact, secretly unwilling to use military force despite all the saber rattling. It looks to me like last month’s National Intelligence Estimate is far from the last word on this issue … in fact, it is pointless.